We have a lot to be thankful for here at Compassion. We get to work with amazing kids all around the world. And we also have the best partners in that work! In no particular order, here are the top five people we couldn’t do ministry without! 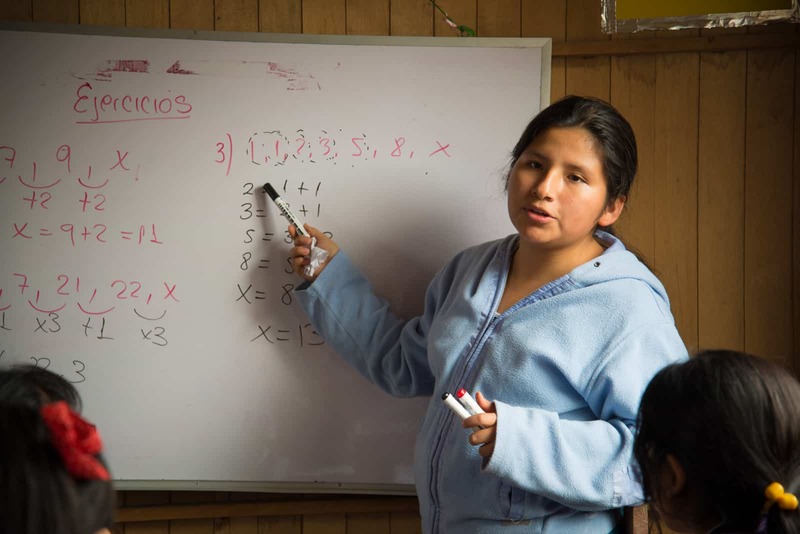 At only 17, Meryl tutors the younger children in math at her child development center. Did you know that many Compassion tutors are volunteers? They spend hours with the kids you sponsor, helping with homework and letter writing. They take their jobs seriously – some even walk kids home through dangerous neighborhoods! Their ministry is vital to the children we serve together. 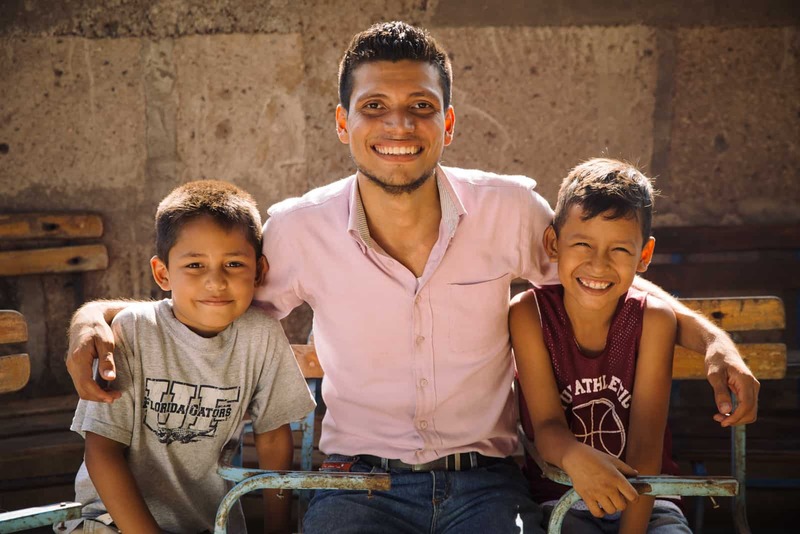 21-year-old Oscar Torres went from being sponsored in our program to being the pastor of one of our church partners in Nicaragua. He gets to help more children just like him. You know that we work through local churches. And that means that we need pastors to believe in the ministry of Compassion. Because when a pastor gets on board, the entire congregation does! Many of the pastors at our church partners are very hands-on, leading Bible studies and even handing over the pulpit some Sundays to let Compassion students preach! 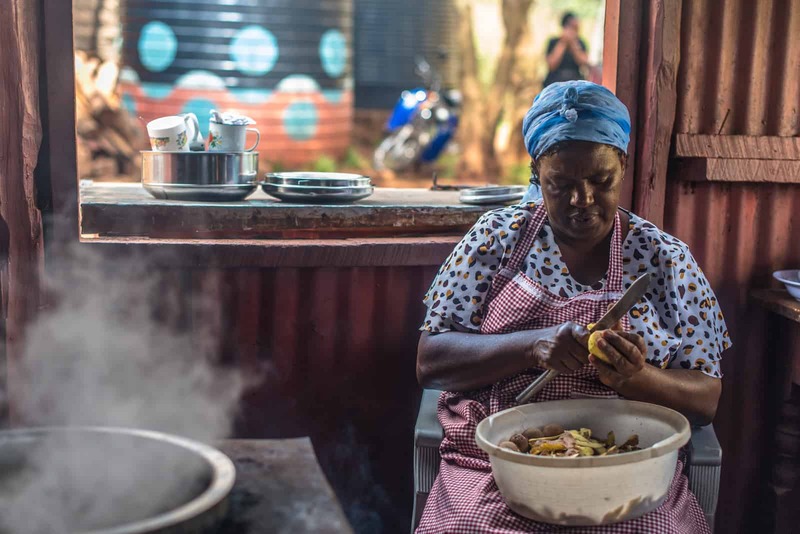 Known as cucu (grandmother) to the students, Monica Mwihaki has been cooking meals for 25 years at her Compassion center in Kenya. Yes, the cooks definitely get their own slot on our gratitude list! Like the tutors, many are volunteers. And they LOVE those kids! 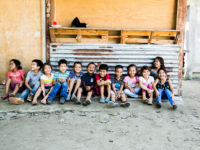 They spend hours preparing hot, nutritious meals and snacks, and find incredible joy in meeting this basic, life-giving need of each child they serve! 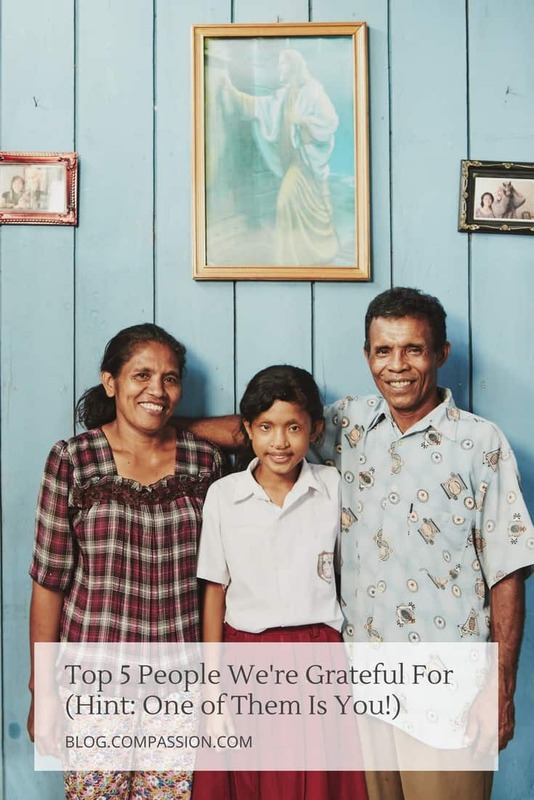 In Indonesia, Silfia and her parents Yonike and Ismael pose with the pictures they keep on their wall of Silfia’s sponsors from Australia. When a parent gets on board with releasing children from poverty in Jesus’ name, that’s when things really take off. 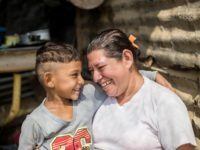 Through sponsorship, you are getting to partner with these parents, relieving some of the stress of being a parent in poverty, and restoring a sense of joy in their homes. We love it when parents take literacy and parenting classes, because then we know that a happy home helps produce a happy child. Watch Thank You for All You Do! and subscribe to Compassion YouTube for more stories. You knew that you were going to be on our list! We’re grateful for your partnership in this ministry. Your support means everyone else in this list gets to love on, serve and pour into children in poverty around the world. So now it’s your turn! What are you grateful for this Thanksgiving season? Spread the gratitude by leaving a comment below! The day I decided to become a sponsor, was the day I promised the Lord to do all I can to help those in need. I am so thankful that HE has given me the health and strength to be able to do so. You see, all I have belongs to Him. I am also thankful for my sponsored children. I enjoy hearing from them. God bless you keep up the good work. I’m thankfully for my parents improved health this year, they were both 86 in 2018, praise our God for his answer to prayer. I praise God for the food he provides for everyone. I am absolutely nothing, and I give all thanks and glory to God for giving me the resources to help those in need. I am awe of God, and it’s such a blessing to see these beautiful children’s lives being changed. I pray that God will receive full glory through this ministry. Much love on the way! Im extremely thankful for the work Compassion does to serve children globally. I’m thankful for all of those that foster this ministry with their time, energy and willingness to serve Gods children. Blessing to all of you during this season of Thanksgiving and Hope. We are grateful to our Lord and Savior that we are fortunate to be able to sponsor Arpita and Diego. We appreciate all the workers who give of themselves each day caring, loving, and teaching these children about how much God’s loves them. I am so Thankful for my little Ana 🙂 and her letters that cheer me up !! Thank you God. I hope my business becomes successful so I can support more than Ana !! I am thankful that God makes me able to give so that someones life is a little easier and I hope to make a small difference in her life. Thank you for giving me the opportunity to help. We take life so much for granted and then we see how some other people in the world live. It really makes you grateful for all that we have and to be able to help someone else. I am thankful that I am able to partner with such a great cause to help free children and family’s from the belief that they have no other choice but what they have been given in life. And of course always Jesus. I am thankful to The Lord Jesus Christ that in his infinite wisdom He has allowed me to sponsor My child Teddy Vundi Muyimi from Kenya…I praise our Holy Name Father for allowing me to serve you in this tiny mission…All praise and honor belong to you alone my King..
I’m so thankful that I can participate in a sponsorship. We’ve had our “son” for over 10 years and have loved seeing him grow. We take care of foster kids (kids that are removed from their homes because the are not getting the care they need). So we know what it is to help kids get back on there feet and back with their families or adopted. Thank you for all you do for these kids. You are God sent. I am thankful for your organization that takes our money and magnifies it to bring honor and glory to God throughout the world. When I see your videos of the children thanking us it just makes me smile seeing them beaming with their own smiles. thank you for all you do. Thank you so much for this wonderful program. Nothing is more important than sharing Jesus with these beautiful children. The video is wonderful. We were blessed to have our two daughters, Cheryl and Kim, at home with us with their families. Cheryl has two children and three stepchildren. Two of the stepchildren are married and we are blessed with three beautiful great granddaghters, Syndney, Scarlet and Thea. Sydney and Scarlet live in Florida but Thea and her parents were here for Thanksgiving. Cheryl’s two children are here in town with us Macey is a sophomore in college studying medicine and Hunter is a Senior in high school. He plays on the baseball team and they won the state championship last year so we are hopeful for another great year. Our daughter, Kim, has three children. Trevor is a Strength Training Coach for Akron University football team, Jay is out of school and works fulltime and Caitlyn is 11 years old in 5th Grade and smart as a whip. I work 30-40 hours a week and my husband is retired an stays at home. He is the lucky one. We attend church at First Christian near our home and have just sponsored another little girl for their program. We trusly hope you have a blessed Christmas and much good fortune in the coming year. Stay true to the word of God and keep Jesus in your heart. We will keep you in our prayers. I’m thankful for organizations that care for poor children all over the world. I am thankful for this ministry and the opportunity to be a part of its mission. May God bless all those involved. IT’S MY HONOR AND PRIVILEDGE TO BE A SMALL PART IN WHAT GOD IS DOING!! I LOVE THE KIDS!!!! I am thankful for everyone that helps these children to grow in Christ and be happy healthy children. I thank God that he helps me have the resources to sponsor a child.. When you see all of them you just wish you could help them ,each and everyone of them. I know God loves them all, and he is with them. I am thankful for a God of mercy and second chances. I’m very thankful for my family, friends and my church and the opportunity to help children all over the world. I am thankful that God has blessed me to be able to be a blessing to others. May Our Father through Her Christ continue to keep you safe and we’ll always. Peace and Love to you all especially to Aaron Ojok and his family in Uganda! I am thankful that I can help, some day I will be able to visit my friend Stanley God bless you all be strong an always keep on the full Armor of God. I am thankful that God put this in my heart to sponsor Stacy, She is a blessing to be and I am thankful that I am able to sponsor her and make a difference in this world. Love you Stacy God Bless you and your parents always. I am thankful that I’m able to, through the grace of God, to support a beautiful child who needs a little support. What an honor to sponsor my child in the Lord Oscielis Moreta Fidanquis in the DR. May the Lord bless her as she grows physically and spiritually and one day I pray she will receive Him as her Lord and Savior. wish i could do more….it warms my heart knowing i am helping kids. I’m blessed every day when I know I’m helping a family and seeing “my little Girl” growing into a beautiful young lady who loves Jesus! I’m thankful for the people that put this program together so there are so many children that can be helped around the world. 1). I’m thankful for this really nice “thank-you” email from you!! Thank you! 2). I’m thankful for happy memories – especially those happy memories of when God has turned a trial into victory!! I am thankful for God and his love, for my family, and the peace I can live in. Thankful to JESUS who makes all the help possible without HIM all this would not be. I would be completely lost in sin – But Jesus – Thats all I can say! that i have been given an opportunity to help make a difference. we are called to serve and to be a light in the world may thay all be blessed. I praise God that he has put it on our hearts to share the love of Christ with little Grace, it gives our hearts such joy. We pray that she and her family grow to know and love the Lord like we have. I am thankful for Jesus in our lives, what he did for us and how he provides for us and our sponsor child. I am thankful for my family and friends and how many of them know him too. I am thankful for beautiful smiling faces on children and seeing them enjoying themselves. It makes me feel like a kid again!!! We are thankful for this ministry impacting the world for Jesus Christ! I am so glad to be making a difference in sponsored child’s life. It has fulfilled my life as well because now I can volunteer at events and help get more children get sponsored by handing out packets. Nothing better than doing Gods work. I am thankful that God have made it possible for me to make a difference in the life of others. I am thankful to be alive in Christ and honored to be a part of being His hands and feet. I am thankful for the beautiful body of Christ, although imperfect exhibits the love of Jesus to all by the preaching of the Gospel of Jesus Christ and by serving those in need. I am thankful for ministries raised up by the Lord to do His work and being able to partner in impacting lives for God’s glory. I’m thankful for Jesus, my family and Junior and his family. (my sponsored child.) Than you Jesus for all your blessings. I am thankful for God blessing me by allowing me to have the opportunity to make difference in the life of another human being. I am so grateful. Praise God forever! I am thankful for Vincent Joseph Diana in the Philippines. He is 13 years old and I have been sponsoring him since he was 6. He is very good to write to me. He is a good student and has a good singing voice. He sings in his churches’ choir. Thank you! Thank you Jesus for using me to help others. I am thankful for my salvation mostly but also for all the promises God is fulfilling in my life and the lives of all His children. I am thankful to have family all over the world that I will get to share God’s blessings with in Heaven. When we accept God’s gift of salvation we are as good as if we are already in paradise. I love all my brothers and sisters all over the world and look forward to worshiping together in Heaven some day soon. God bless. I praise the Lord that I can help in this way. Thank you for all you do in helping each child and their families. It is amazing that God can take even the small gifts and do truly wonderful and awesome things with them transforming lives into powerful warriors for Him. Thank you for this opportunity to serve. Singing, EVERYDAY WITH JESUS IS SWEETER THAN THE DAY Before! I pray for health strength and happiness in Jesus for all these tutors, teachers, pastors, and more who love these Children! Sing with me, Jesus loves the little children…All the children of the world, red and yellow, black and white all are precious in His sight. Jesus loves the little children of the world! Thank ou JESUS for the Cross and the ability and desire to GIVE!! Thank You JESUS for the Cross, Salvation and the ability and desire to GIVE! I’m thankful for the opportunity to help, even though I can’t be there, I feel apart of God’s holy family through the work that all you people do to provide for the children and their families, in Jesus’s name and the Gospel. We are thankful for the opportunity to help a child in need. And for God allowing us to have the resources to contribute to this fantastic organization. When I pray for my family, Arfasie is always included…..her picture is in a frame right along with my grandchildren…..I thank God for the opportunity to make a difference in her life, and I thank you for giving us this opportunity. Am thankful for our Prescious Saviour Jesus Christ . And all that he has allowed me to do. To help ease others life and bring joy to someone. For the love and happiness Jesus brings to me and my life. God Bless. I am thankful for my sponsor. He blesses me more than he could ever imagine. The bible verses he quotes in his every letter to me are so timely, exactly what I needed to hear and feel peace. Thank you to everyone guiding my sponsor. We are helping each other care for children for His glory. I am thankful for Rocio, Abraham and Nestor. Because of them, we have been given the opportunity to give in the name of Jesus and spread His word. May God bless all of God’s children. In Jesus’ name, Amen. Heart to help those in need. Thank you always my Holy Lord and Savior Jesus. My grandson, 12 years old, asked me to help him sponsor a child. He is very committed. He chose a very young boy so that he could make a difference in his life for a long time! He has mowed our lawn to pay for his part of the sponsorship. We are so thankful for this opportunity to share the love of Christ. To pray for his family. I am thankful for all that God has given me. All that i have came from Him. I am thankful that He has blessed me enough that i have extra that i can bless others. I am so very thankful that Jesus came that I might be forgiven for my si through His dead on the cross. I am thankful for my heavenly Father who has given me salvation through His precious Son, my Lord and Savior Jesus Christ! I am thankful for having the opportunity to support Ruby and many other children through different Christian organizations who teach these precious children about our Savior. I am thankful for all who give their talents and efforts to help the children in their care through the love of Christ and dedication to their work. Thank you for this video so that I can see all the wonderful children that Jesus loves so very much. How blessed we are to have all that care for our children–those that we sponsor. I send a virtual hug to all the pastors, cooks, teachers, and helpers who love these children that Jesus and we hold so very dear. Thank you, my awesome God, that we have organizations, volunteers and sponsors that help to care for God’s children. I’m thankful for my sponsor child, Kwame and my family and friends! We are grateful God gave us the opportunity to bless others through this wonderful ministry. It makes us smile to see the happy faces of so many children and families around the world. We have been blessed with two wonderful children from this ministry, Anglis from Columbia and Adrian from Peru. We now have 4 children 2 biological and Anglis our daughters and one son Adrian. All four are precious gifts. We pray for the entire staff who diligently play key roles in the care and welfare of these precious children. Thank you for all you do on the front lines. God is good. My family is so blessed to be a part of this wonderful ministry. I gotta say cooks, I’m pretty jealous of you all feeding and loving on the little ones… 😊 Delighted to participate in Kingdom work! I’m thankful for a Christian father and mother who taught us how to care and truly love each other. I love my sponsor child Juliana and her family. Her letters warm my heart! I love that she is learning so much more about Jesus and His love for her! I am thankful for an almighty , forgiving God that has blessed me with so much that I don’t deserve. It gives me such joy that I can sponsor a child that might not have much in the eyes of many, but yet she has so much because she has accepted Christ as her Savior. Adding on to that is the influence she has on so many around her. It is a privilege to be able to help! I am very thankful for God’s blessings in my life. I am thankful he has giving me the resources to help a child in need and for that child to learn and grow in Jesus name! I am thankful for the grace and mercy i am shown by Christ every day. That he changed my life when i deserved nothing, which brought me to where I am in my life. Faithful as possible and blessed with the opportunity to use Gods money to bring hope and love to children. My family and I are so thankful we are able to help others who help many in the name of Yeshua Christos (Jesus Christ). Such a wonderful thing to do for children, it warms my heart and wets my eyes thinking of them all. We just started sponsoring and picked 4 of the longest running children on the website. God willing we will sponse 4 more before the year is out. I believe that God will sustain our ministry to support your ministry. All for the Glory, Honor, & Praise of our Savior! Thank you for what you all do! Blessings in Christ name! Thanksgiving is a day to reflect on the way God has blessed you and your family. I’m a truly blessed to have had an opportunity to make a positive difference in Judith’s life and thankful that God lead me in spirit to sponsor her. To think she will be able to grow up and have the skills to change her life is what I’m truly thankful this thanksgiving. I am thankful to my heavenly Father because of His wonderful love to us! I am so thankful for the opportunity to share my blessings with Rafael. I’m also thankful for all of the people who are helping Rafael. It is amazing how Holly Spirit have working in souls that giving hope for those in needs. I’m thankful our heavenly Father for His presence in my life, Thanks to all volunteers who do this job, may God bless you, give you His strength and power. I am thankful for Macklynn Biira my sponsor child and her family. They are beautiful and I love her letters! May God bless our sweet child we are helping. We are thankful to be a part of a Christ centered program that actually makes amazing changes in our sponsored childs life. May God enable us to see this through, until Anyi Noeli is a grown woman. Prayerfully we an continue being a part of her life and us a part of hers fro as long as God allows.. Thank you all for working so lovingly and hard for these children! I am thankful for a life in Christ and for the ability to share his love with others. God bless the teams who work to help the children daily. I pray that God continues to give them strength. Thank you for the opportunity to watch the love of Jesus flow to children in need and for letting me play a small part.It is truly a privilege to see these kids grow in character, intelligence and faith. I’m thankful for my little girl who through God’s intervention we were blessed with through adoption and I’m thankful I can sponsor Maria! God is good all the time! Thank you Jesus! God loves the little children and I am blessed bY them. Thank you children for sharing your joy. Bless all the pastors,teachers and cooks and those that share. Mary Poillucci. I am thankful for the opportunity to help a child in need so he can grow and be healthy spiritually mentally emotionally and physically! I give God all the glory for what He is doing! Jesus loves the little children. All the children of the world Red and yellow black and white! They are precious in His sight ! Jesus loves the little children of the world! I am thankful that you are the hands and feet of Jesus. Thank you for caring for children who God loves in ways that we as sponsors simply couldn’t do. The children seem so thankful for the help that we are able to supp;y. Thank you for this video and for sharing Gods work with these children and families. I am so grateful to be apart of the life change and being able to sponsor Zainabu and being apart of her journey. I am grteful for being used to do Gods work and serve this mission. Thank you for this video and being an inspiration through Gods work to deliver his grace and message by using me as a vessle to reach these children. So very grateful for the hands that serve from hearts of Love. You are world changers; may the Fruit of your ministries be multiplied through eternity in the lives you touch. I am thankful for being able to sponsor children as they are so precious! They are the example to us of how we are to approach our Lord and Savior — as children, willing to let him guide us and sustain us and to fully rely on HIM! Thank you to all those who care for these wonderful children! I am thankful for the ability to make a difference in David’s life and the other lives I am allowed to touch. I wish I could sponsor a hundred kids. They are so special and happy for anything I send them. I see how they grow and mature. Thank you for making all this possible. I am thankful that my Father in heaven provides for our family and is using me as his instrument to provide for others. I am thankful for the love God has shown me after the death of my wife, Nancy, four months ago today. Nancy and I were married only 5 years (both first spouses died earlier) but I loved her more than I can ever count. She brought me to the place I am today at Salt Creek Church in Dallas, Oregon. I am now moderator, deacon, and working with 3 6th grade boys plus working with the total group of middle school youth. God has taken my best friend home but he has showered me with love. I am the person who is blessed. God has been so good to me and it thrills my soul that I can share these gifts with others in need. It is a great privelege that I have been given. It is a great opportunity to be able to make a difference in a child and their parents lives. I am so thankful to Jesus who gives us this opportunity. What a joy! My favorite check to write each month. I am thankful that I had a wonderful childhood, a good marriage & raised 4 children in USA. I am thankful that I have resources to help Bethlehem. I enjoy getting news from her, & I pray for her daily. Thanks for your leadership. We are thankful for this Agency to bring it all together and share the Gospel of Jesus Christ in our fallen world. We are thankful for and humbled by the opportunity to be Jesus’ hands and feet by making a small difference in one young person’s life. We are thankful to those who are out among those who need Jesus’ love. We are thankful to Alizeta for allowing us to be a part of her life. Happy Thanksgiving! I am thankful the Lord provides for us so that we can help provide for a child or two in the name of Jesus. Thank you all for your work and ministry in touching these lives and building the kingdom. God bless you special during this season of thanksgiving and love!! We are thankful for and humbled by the blessing of being able to be Jesus’ hands and feet by making a small difference in one wonderful young person’s life. Thank you to all those who are out among those who need Jesus’ love. Thank you for your faithfulness. And we are very thankful to Alizeta for allowing us to be a part of her life. Happy Thanksgiving! I am thankful for my family and all that God and this life have given me. I am grateful that I am able to sponsor a child and make a difference in his life. I’m so happy that I have been given the opportunity to make a positive difference in a child’s life. This is what Jesus would have us to do. As a person with no children of my own, it gives me great pleasure to feel that I can make a difference in a child’s life for the better. God bless this organization. I am thankful for God’s grace and mercy and having the means to help a child/family in need. I am very thankful that God has provided a way for me to continue to help with my sponsored young man, Dawitt, from Ethiopia. I would love to hear more about his life and the changes brought about by the contributions God has helped me to make to this great organization. Keep up the good work and may God bless each and every person who is a part of this group who brings a smile to all these children. Thank YOU for being vibrant, curious, wonderful children! We are proud to be a part of your lives and love to watch you grow and learn and succeed. May God bless you all! I’m thankful for all of God’s blessings which are too numerous to list but most of all His Son’s cross, death and resurrection giving us the opportunity for Life eternal with Him!!! Praise you Jesus and thank you! Funny how I end up being blessed by all those beautiful children! So grateful for the opportunity to love in the name of Jesus! It is an honor, and I look forward to learning more about my special one. But they are ALL special in God’s eyes! It has been so rewarding to sponsor our Woojina in Haiti for four years.. If more people would just look around at the luxuries we take for granted. God gave us more to share with those in need. We pray God will keep her safe. Love the smiling faces of every child. I am thankful that God blessed so our family can help you learn about JESUS! I’m grateful that we have Louis in our life and would love to meet him one day.I’m grateful that I accepted Jesus and have a promise to be with for eternity. Thankful for being one of Gods children and all his daily blessings, and the sincere friends in my life and all of God critters plus H is unconditional forever love. I am thankful for the wonderful life I have thru Jesus. I am thankful to be able to have the means to sponsor a child. I am thankful for life and freedom. I am thankful to God. I have not heard from Wilmer David in Dom Rep since the Hurricain. Please let me know. Thank you. Hi David! I actually see a letter from your child, David, in translation right now :). It should be available for you to read very soon! Thank you Pastors, tutors, cooks and parents, you are specials for me. God bless you always. You do a spectacular job, with everyone child. I am thankful for God, life, breath and family. I am thankful that I love in the USA where I am free and have the opportunity to learn and have a successful life so that I could grow old in peace. I’m thank ful that i have more than I need and can help others. I’m thankful for my faith in the Lord Jesus who died so that all may live. I’m thankful for the path Jesus set before me. That He has lead me to my sponsored child and the ability to help someone else grow in Jesus name. I’M thankful for the love Jesus has shown me, and for the opportunity t6 share that love with others. In thankful to be a blessing to others! Thanks to God! Thank you so much for accepting my gifts to you! Thank you Jesus for opening my eyes and heart. I once was blind but now I can see! Love you all! Thank you for the opportunity to make a difference. This video makes it real. I’m so thankful for the Lord Jesus Christ and what He has done for us. I’m thankful for the many blessings He bestows on everyone. I’m thankful for people made in God’s image and for all Christians. I’m thankful that God sustains us and comforts us in our time of need or sorrow. I’m thankful for the joy He brings to my life. We are thankful to be able to sponsor Pim. What a gift God gives us to extend His hand to others! I thank God every day for my family and for the wonderful life I have, but mostly, I am SO appreciative to Him for loving me and forgiving me!! We are all truly blessed to be one of God’s children. His chosen and loved. I too am thankful. For all who help and share the love of Jesus. Thank you for helping and loving these children in Jesus name. They learn who Jesus is by the people that help them. They will be able to tell others about Jesus in the future to bring them into God’s kingdom also. Thankful for my family being together this week! I’m thankful for my family and my health, for my home and the many blessings God has given me. Thank you, Jesus! I am thankful that God pursed me & got a hold of my heart 15 yrs ago. Now I can give back to Him for all that he has done for me. Thank you for this video. It brought tears of joy! To God be the glory! I am thankful that I was given the opportunity to make a difference in Mirvin’s life. He is a very special boy and I love him! I’m so happy that I could make a difference in a child’s life. The Lord has been good to me and my family and I want to share with God’s children. I am thankful for ability to sponsor a child and help her to have a better life as she grows closer to Jesus. Thankful for her teachers, pastor and cooks. I am thankful for Jesus loving me and saving me from my sins, also for speaking to my heart to sponsor a child in need. I am thankful for my cild, her growth and witness to God’s love. I am thankful that I know my Jesus. That I am able to make a difference In Ruth’s life. She has blessed me. I am thankful for my child and her growth in love and in witness to God. I am thankful that I can minister to God’s heart by giving and writing letters to these precious ones, who are always on God’s MIND. Hi Donna! The easiest way to send your photos would be to send them along with a letter through your online account. Through the “Write My Child” link on the left side of the screen, you can go through the steps of writing a letter to your child. The third step of the process includes adding photos to the letter itself or to two additional photo pages that will be included with your letter when it is printed out and delivered to your child. Thanks to all the wonderful individuals who make this program run. So many families are saved by this program, God’s will is being done. I am so very excited to see the growth and transformation of the beautiful girl that I have been blessed to sponsor. I am very grateful that I have been blessed to have the ability to bless others. I am looking forward to watching the children I have sponsored grow in the life of Christ and share the journey with them. Our family is very honored to a source of strength to our Tedaish . We look forward to the letters we receive from her. We are a blessed people here in the USA and if everyone gave to just one child ,one family we could bring health and hope to all. I’m thankful for Jesus and the food that is provided. I’m also thankful for my family and my friends. With that I am thankful for the roof over my head and a place to live in. Most importantly I am very thankful for being able to sponsor you. 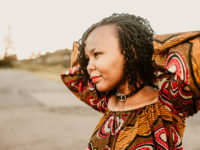 After my husband and I had our son, I wasn’t able have anymore children. So by sponsoring you, it’s like having another child only you are living some where else. And my family and I have the opportunity to keep in touch with you and get to know you. I thank God for the many blessings He has given me , each and every day of my life. I am thankful Jesus has made it possible for me to be in the position to be of help to my sponsored child/family. Thankful for Salvation through Jesus Christ! Thankful for my health and my family’s health and for the ability and means to help sponsor one child and family. I am also thankful for my Church’s youth group who wanted to partner with me to sponsor a child! and finally, I am thankful for all the volunteers and missionaries who sacrifice for the Kingdom of God! I am thankful for God who made it possible for me to love little Stephany Espinoza because He first loved me. I am grateful for the staff in my boy’s project who helped him when he got the zika virus. He called them his “uncles”. I want to thank all the tutors for the love they give my 21 kids! They make an awesome difference in the lives of the kids in each church project. They are Jesus’ hands and feet on the ground in the different countries. Thanks for the video…it warms my heart to see all the children in the video! What an honor it is to help these people serve our sponsored children and their families. I am thankful for this program and that we are able to sponsor a child in Kenya. I am thankful for a loving God who is always there to support and provide health and healing to His children. I am also thankful for an organization that brings God’s children together and allows each of us to contribute towards supporting children in need. Thank each and every one of you for all your hard work, dedication, commitment, and most of all love! Thank you for your kind comments. I appreciated the video of the children, workers and others. Please join me in praying the Lord will bless me with abundant funds so that I can sponsor many children . I am almost 88 years of age and had major surgery Oct. 4th. Please pray I will regain strength rapidly. I am thankful for the great joy that I get when I receive a letter from Njira our sponsored child and that Jesus in in her life. I am thankful for my Savior and the gifts He has given me. A husband, two beautiful and healthy daughters, a grandson, church family, and a job I love. He has given me the ability to sponsor Lindsay and even though our finances are always tight He has always provided for us. We are thankful for the opportunity to be able to be a part of helping the children.we have sponsored for 20 years. Wht a blessing. I am thankful for having the opportunity in being in service to the Lord and being able to sponsor Ms. Ashley Nicole. I have been up and down in my finances, and a few months ago my account was hacked. But I stepped out in faith, and I pray that I will be able to continue to share just a small portion of what God has blessed me with. I’m so thankful for God’s Word and that it is translated in so many languages to bring the reality of Jesus to our understanding. The Bible never gets old! You make a difference in our life, being able to share just a little. God is important in our life and yours. Thank you for helping us share. I thank the good Lord that I am able to sponsor Omunyu Ezera. I continue to ask the Lords blessing on him and all the children. I am grateful for the privilege of being the sponsor of Harits. I especially thank him for his letters, something i really look forward to. I love to see new pictures of him to see how he has grown. I thank Jesus that HE placed us with each other and I love Harits dearly. I am thankful for God my father, his son Jesus, the Holy Spirit. I am thankful that they have blessed me so I can be a blessing to whoever I can. Thanks for all of the children of God that are daily working to make a difference in so many lives. I am thankful for the love of God which compels me to care for others. I am grateful for the opportunity to make a difference in the lives of two precious children! Thank you for this encouraging video! I am thankful God brought me together with my sponsor child, Hélène. This month is our 3-year anniversary! I am thankful for the opportunity God has given me, to be able to help Jhasmin Mamani and her family. I pray what little I give will make a difference in her life. Thanks for allowing me to be of service. I am so grateful to God for bringing me the opportunity to be a Sponsor. I hope and pray that I, through Jesus, am actually making a difference in a little girl’s life. I am thankful to all that take part in this wonderful ministry. I was incredible blessed to have the opportunity to visit Project 534, 535, and 542 in Ecuador during a recent Mission trip. During this trip, I was able to meet and develop a personal relationship with my sponsored daughter and her family. Happy Thanksgiving wishes from across the miles from our house to yours. May your home be filled with laughter and happiness! Sending you my warm wishes from home to home and from heart to heart to wish you a very Happy Thanksgiving! May this day be a beautiful reminders of the wonderful things in life. May the peace and blessings of the good Lord be with you always!!! I am thankful that God has enlightened me through the Holy Spirit to know it is better to give than to receive!!! I am thankful to God for giving me the ability to give love to others that are less fortunate than I am. I am proud to be able to give hope to my sponsored children, someone said “Preach the Gospel, and if necessary, use words. Thank you, Jesus. I’m thankful that God has blessed me so that I may give financially, but so much more grateful for the many people that physically pour into the children’s lives around the world!!! Thankful to GOD that he has given me the resources that I can help a child. The video brought tears to my eyes. The video reminds me your not simply writing a check, you are helping to change a child’s life. I am thankful for the opportunity to support Surenthiran and for all the other people that contribute to making life better for children everywhere. I am also thankful for my own family and friends that make my life so wonderful. Most of all I am thankful for Jesus who died for me and gives me hope. Thank you for the opportunity to serve these children in the name of Christ. God bless you all. Thank you for giving me the opportunity to make a difference in my sponsored child and her family’s lives. Thankful for all the sponsors and all the people who help this ministry in Jesus’ name. It has been a privilege to support and pray for Mary Grace for over 10 years now. To God be the glory!! I think in the 33 years that we’ve been sponsoring about 9 children, it has proved to be more a blessing to us than even to the children. It has been a glue that holds OUR family together as our daughter and son are now requesting to join our yearly Christmas tradition of giving through the Christmas catalog rather than receiving gifts from one another. Wonderful video. Wonderful children. Wonderful ministry. Thankful to play a small part in all of it. I am privileged to know Pius and to help him. i am very thankful for this opportunity. I am thankful that God has blessed me so much that I am able to bless others. I am thankful for Dieyabidi being a part of my life. I am also thankful for all the other people in his life who are helping him on a daily basis. Thank You Jesus for all that You are! I am thankful for Ganyo allowing me to be a small part of his life as “we” watch God do amazing things for him and his whole family. I am thankful for organizations like this one that listens to God and then acts. So glad to be a very small part of this wonderful ministry!! So thankful for the love of Jesus I know every single day. I am thankful to God for giving us his Son Jesus Christ; that we have been given unlimited grace through through our Lord and Savior! I hope that everyone has a very happy thanksgiving. I am thankful that the Lord is so merciful to us. I am thankful that He has called me out to serve Him in a very small but meaningful way. Thank you for all you do. We are thankful that we have an opportunity to serve Jesus in places very different and far away from our own…that His hand reaches as far as from East to West. May God Bless all those that have a heart for this ministry. I am thankful for all of the people who support these efforts each and every day. And I am thankful that Jesus is present in all of our lives to love us. We need to continue to care for each other in ways that glorifies Him. I am so thankful for the grace and love Jesus has given me when He saved me in 1974. I am so thankful for the precious children I am blessed to sponsor – Wilson, Girume and Jose. I love receiving their letters and I pray God will continually bless, guide,and guard them and their families. They are beautiful children. I am so thankful for having the opportunity to sponsor Joel. I am thankful for Jesus and for the opportunity to make a difference for Jesus in one family’s life. Thank you for all you pastors, cooks, teachers, and helpers do to love on people for Jesus’s sake and for the sake of the Gospel. We have so, so much here in America and it’s nice to be able to give to those in need who truly appreciate anything they receive. What incredible witnesses they are for us. May we all stay humble and generous as Jesus continues to bless us. Thank you God for giving me a job so I can be a sponsor at my age. Thank you to all those workers that give each day to reach these children with the love of God and His word by their acts of caring and sharing.